In 2017–18, Counterpart expanded our reach to more women affected by breast or a gynaecological cancer across Victoria. 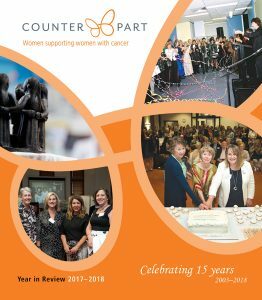 The Counterpart Year in Review 2017–18 celebrates our achievements over the last year. Highlights include stories from women who used our service, women who volunteer and health professionals. We have expanded this Year in Review to commemorate our 15th birthday, with photos and highlights from our history as BreaCan and then Counterpart.